The Culture Farm Bjerkem is located on historic ground in Henning in Steinkjer. Bjerkem is one of the many "old Trønder farms" situated on the top of a moraine Ridge, with 2-3 burial mounds close to the courtyard and and the old thoroughfare through the yard. The farm has been in operation since around 500 AD, interrupted only by the Black Death, when the farm was abandoned for a time. We are mindful of, and are actively using the farms cultural heritage and have unique stories to share.The atmospheric premises on the farm provide a very special framework for experiences for both work and leisure. We receive groups for dining, meetings and events. North-Trøndelag Folk Costume museum – Bunadburet is also located on the premises. At Bjerkem we have premises available to suit most occasions – i.e meetings and events, christenings, weddings, memorials, confirmations etc. These premises can be hired on their own and you can manage the rest yourselves or we can arrange for organic and local dining, entertainment, lectures, courses etc. We tailor menus adapted to the season and the occasion. 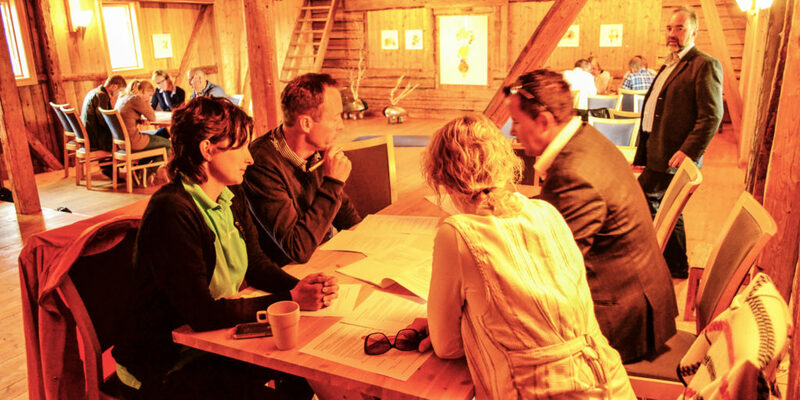 Bjerkem feature 10 different meeting rooms at the farm accommodating 6 – 100 people for meetings or conferences. We have, of course, all modern conference equipment and wireless Broadband. Groups holding their meetings and seminar at Bjerkem, use external speakers or they hire us as instructors or seminar leaders. We also cooperate with KultLab AS regarding programs for businesses looking for development with experience and experienced Development! You can rent Bjerkem with or without food service and with or without host. We can cater for up to 80 people in “Gammellavin” dating from 1891 and 20 people in the neighbouring room. A small group of up to 16 people can fit around the table in “Masstu” which creates a cosy and harmonious atmosphere. 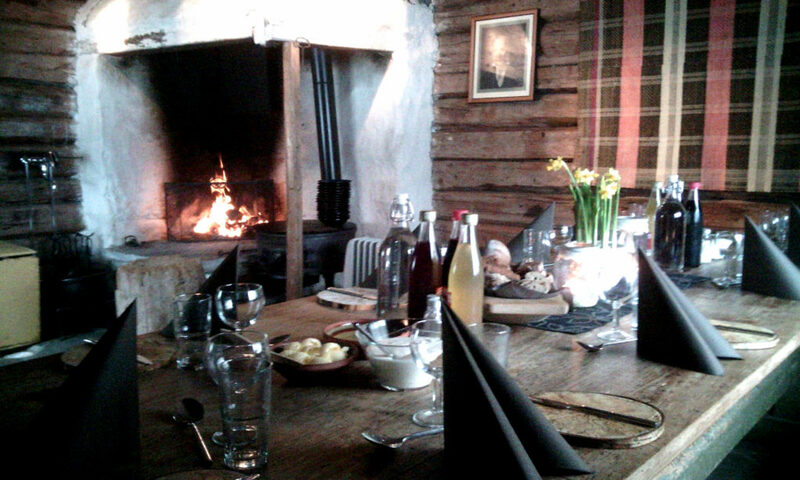 We serve local and organic food, with meat sourced from our farm and the firm “Naturkjøtt”. 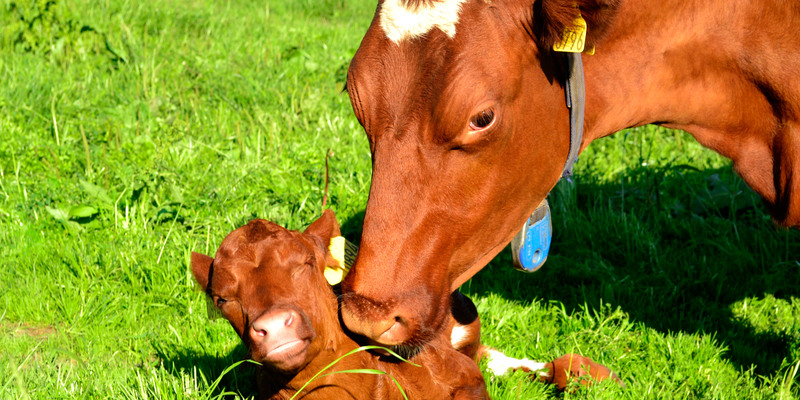 Delicious meat products from the farm are combined with local vegetables, cheese and other dairy products. We are passionate about ancient grains and we cultivate several types of old grains on the farm, from which we bake wholemeal and white bread and pies, amongst others. We have developed our own special beers that are served only on the farm. Bjerkem Farm is run organically – and our kitchen is one of few in North-Trøndelag which is Debio approved. On the 15th September 2017, the gourmet restaurant “Experience” opens its doors for the first time at Bjerkem. This will be a restaurant where people buy into a whole experience from A-Z, not a A La Carte restaurant. The restaurant will be open on Fridays and Saturdays. The guests will predominantly be seated around the long table in the unique “Masstua” from 1891, which can cater to 16 people. However, a further 20 people can be accommodated up in the atmospheric barn loft. With the diverse availability of food in Trøndelag; of meat, fish, vegetables, mushrooms, berries, milk, cheese etc – we can promise many delicious short travelled (local) and no-travelled culinary experiences here at Bjerkem. Our chef is the Michelin chef Kim Tore Sjøbakk, who has 12 years of work experience in London, amongst several Michelin star restaurants. To book, call Torunn on +47 97562667 or email: torunn@bjerkem.com. Should you want activities and experiences in connection with your arrangement, the hosts happily regale you with stories from from the farm of today or through the ages, or story telling of local fairy tales. The culture landscape also contributes to wonderful and atmospheric “walk and talk” and good thinking breaks. The combination of light and silence inspires. -is located on the farm and is also the premises of Nord-Trøndelag Folkedraktsaum – folk costume production and exhibitions. 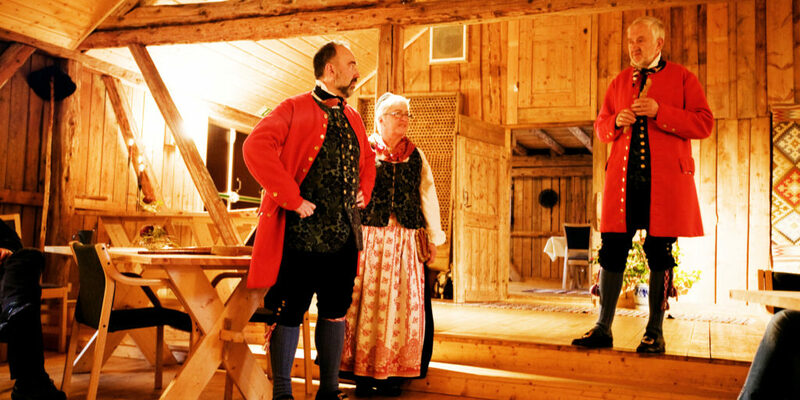 Bunadburet is the producer of bunads which is based on the reconstructed folk costume customs in North-Trøndelag from 1790 – 1830. We offer a guided tour of the building from 1851, focusing on the building or focusing on the reconstructed folk costume customs in the county. Every summer, we also feature 1 or 2 art exhibitions. Shows the development at Bjerkem over 2000 years. A nice walk around the cultural landscape when there is not too much snow. The hosts entertain you with fairytales in front of the bonfire at “Masstua” from 1891, or regale you with managment and busienss stories combined with other contemporary stories. We often have art exhibitions or other exhibitions at Bjerkem. In Bunadburet, we are showcasing the historical costumes through a permanent Exhibition. Ask about guided tours. We have good contact with some of the country’s best folk musicians. Additionally, we can source both blues, roots, jazz or classical musicians and . dance bands or dance orchestras. We have a large and wide network of contacts – and can promise great experiences with leading artists if you want an exclusive and unique experience. We travel around the world providing Dance lessons. Folk dance, swing, rock and genuine country dance can be found at Bjerkem. Maybe a first aid course in Pols dance – in 10 minutes – may be a break in the meeting day? 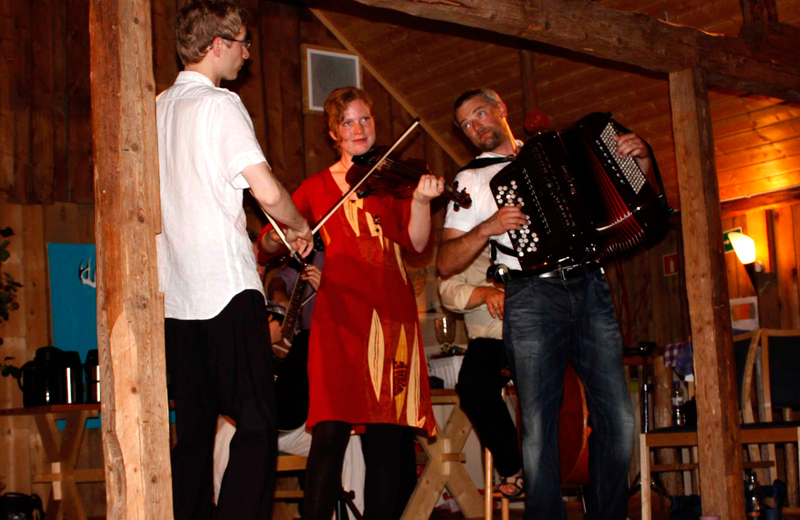 If you have a group of tourists and want a show with Norwegian folk music and folk dance you can contact us. If you want to work on an organic farm during your vacation – or you want to use farm work as a team-building activity for the group, please contact us and we will assemble an arrangement!